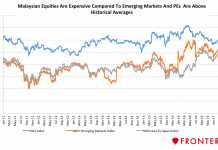 Home Global Equity Are Qatar’s Equities Now Attractive Buys For Bargain Hunters? Are Qatar’s stocks valuable now? Geopolitical tensions in the Middle East (GULF) are driving volatility in stock markets both regionally and across the globe. GCC nations are some of the largest producers of oil and gas, and with the risk of supply of oil, prices of this commodity shot up initially but collapsed in the following days. Such events also prompt investors to favor safe haven assets like gold and the US dollar. Some analysts believe Qatar’s stock market may offer value to bargain investors after the sharp correction. However, they warned that if this crisis persists longer, the country risk premium demanded by foreign investors would rise sharply. 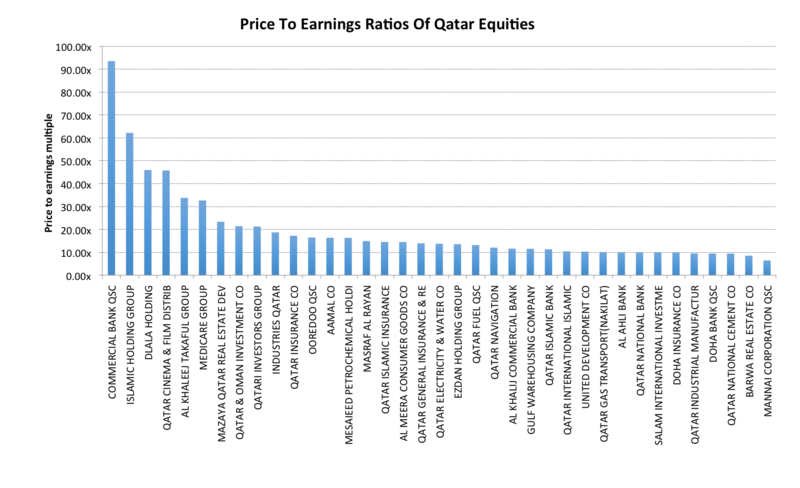 A regional equities fund manager based in the Middle East stated, “there is value there, and although the political situation is not encouraging, there are some good buys.” Currently, Qatar’s (QAT) QE Index trades at a PE multiple of 13.4x. Stocks like Mannai Corporation, Barwa Real Estate and Qatar National Cement are trading at a steep discount while Commercial Bank QSC, Islamic Holding Group, and Dlala Holdings are at a premium. 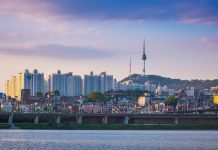 “Investors must keep an eye on fundamentals,” said William Jackson, a London-based emerging-markets analyst at Capital Economics Ltd. “Qatar’s still got enormous foreign currency savings, its debt level is relatively low and the authorities have plenty of scope to support the currency,” Jackson added. 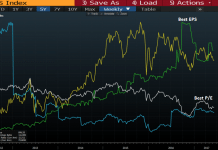 Win Thin, the head of emerging-market strategy at Brown Brothers Harriman & Co. in New York is overweight on UAE (UAE) and Egypt (EGPT) after the recent conflict and is bearish on Qatari stocks. 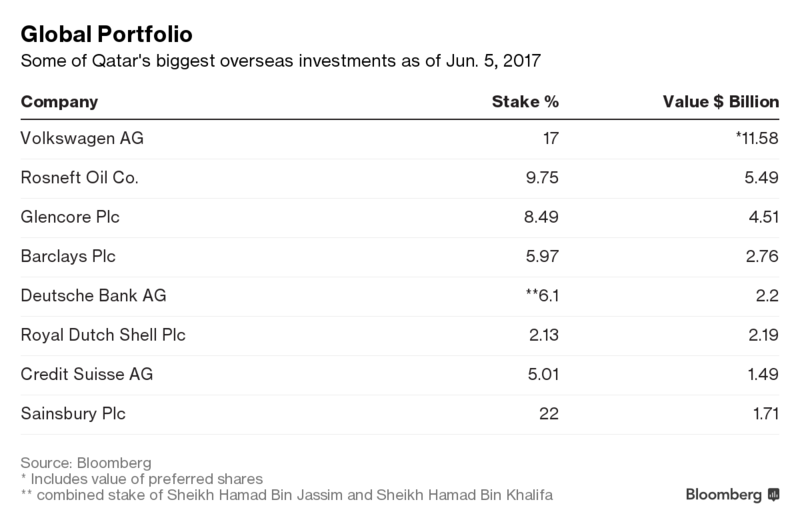 Qatar’s $335 billion sovereign wealth fund is among the largest globally and invests in blue-chip stocks like Volkswagen (VOW), Tiffany (TIF), Empire State Realty Trust (ESRT), Glencore (GLCNF), Royal Dutch Shell (RDS-A), Credit Suisse (CS), Deutsche Bank (DB) and Barclays (BCS). In December it bought a 19.5% joint stake with Glencore in Russia’s largest oil and gas producer Rosneft. It is also the largest investor in Qatar’s largest bank – the Qatar National Bank (QNBK). With sanctions on trade routes, Qatar’s economic growth will likely slow and the country will be prompted to deplete its reserves to fund its spending. This could directly impact the fund asset base and the companies that it invests in.